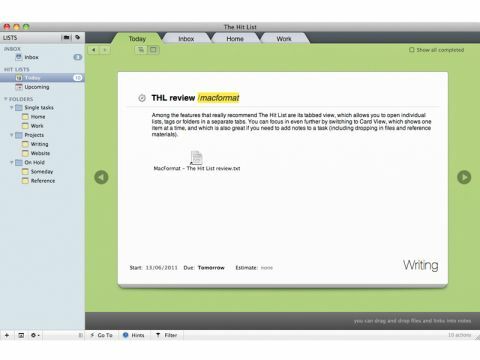 Long thought to have been abandoned by its developer, The Hit List suddenly appeared on the Mac App Store early in June. When the app first entered its public preview, back in January 2009, it quickly became a favourite of many. Lightweight, intuitive, powerful and yet less complicated than some similar applications, it makes getting through your to-do list an elegant and enjoyable experience. Among the features that really put The Hit List on top is its tabbed view, which allows you to open individual lists, tags or folders in separate tabs. You can focus in even further by switching to Card View, which shows one item at a time; it's also great if you need to add notes to a task (including dropping in files and reference materials). As with many other task management apps, you get a quick entry window so you can add items from anywhere without needing to foreground the app. There's a clever timer if you need to track exactly how long you spend on a task or project. Tagging uses a quick text-based system (just append /tag after your task for a general tag, or @tag for location-based tags). And, best of all, The Hit List is full of handy keyboard shortcuts, making it easy to use for those who like to keep their digits in the loop at every step. In such a busy section of the app market, it's hard to stand out. We think The Hit List does just that. Its accompanying iPhone app is well designed, and the sync system, though a tad costly (around £12 per year) is quite brilliant.